Should there be a catastrophic event that caused the lake control device to fail at Syracuse, this map shows what Wawasee could look like. 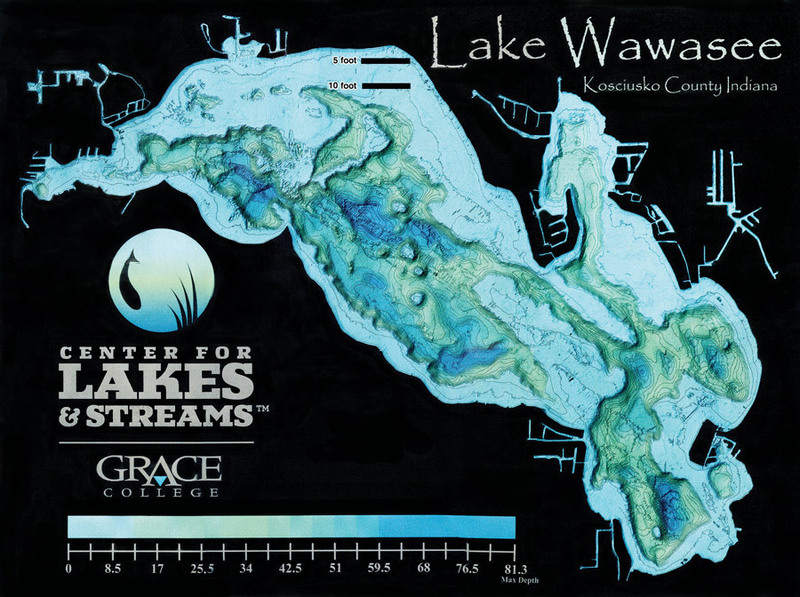 Created several years ago by Lilly Lakes & Streams using acoustical technology, the map shows the current shoreline, with the next line in the lake showing the depth of 5 feet and the third line showing the depth of 10 feet. A catastrophic failure to the control structure could move the shoreline between the 5-foot and 10-foot area. SYRACUSE — Let’s set the record straight. The Turkey Creek Memorial Dam is not a dam. 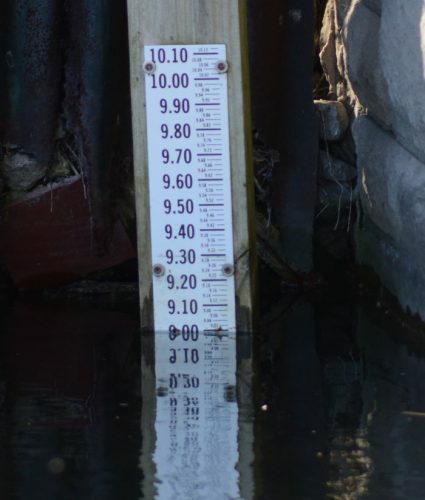 It is a lake level control device according to Art Garceau, former employee with the Indiana Department of Natural Resources Division of Water and Streams. While this structure is in need of repair it is not in critical condition. But why are the repairs needed and what if repairs are not done and the areas noted by dam inspections fail? What are the impacts upstream and downstream? 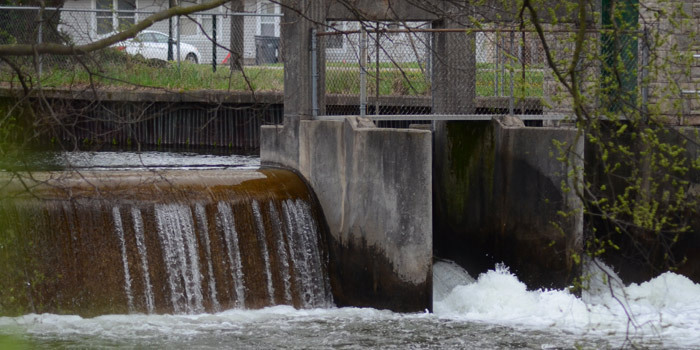 Spalling on the ogee weir (spillway) at the lake level control device in Syracuse is already taking place. Spalling is where water enters concrete, brick or natural stone, forcing the surface to peel, pop out or flake off. In this case water is coming through the ogee weir. The control device received an unsatisfactory inspection in December 2017. Inspected every four years, the next inspection is due in 2020. 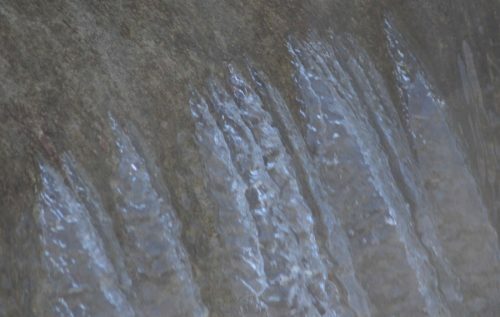 Regarding the condition the principal ogee weir — the curved spillway of the device is spalling and deteriorating. 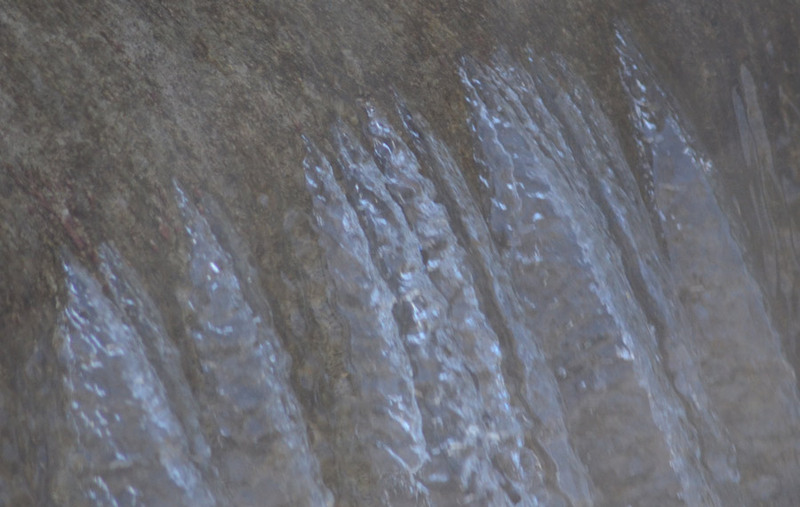 Spalling is where water is entering the concrete forcing the surface to peel, pop out or flake off. The question arises what if there is any type of failure at the control device, what happens to Wawasee Lake, Mudd Lake and Syracuse Lake. What happens downstream? Because the device was constructed to keep the lake level at 858.87 feet above sea level or 8.87 feet, set Sept. 20, 1948, by Judge John A. Sloane, Kosciusko Circuit Court, the lakes have been usable for recreational purposes and provided a substantial economic impact to the area and county. But should there be any type of failure the lakes would suffer. Ed Rock, county emergency management director, stated based on the acreage of Wawasee for every foot of water lost in the lake it would equal 325,851 gallons going into Turkey Creek. A catastrophic break in the control device could send millions of gallons downstream. Immediately affected would be the bridge on Henry Street, just below the structure. Also negatively impacted would be the Syracuse Wastewater Treatment facility. From there homes and farmland would be affected. The current level of the lake is at 9 feet, .13 feet over the legal limit. One of the control gates is open and has been open all winter according to Chad Jonsson, who controls the gates. Mike Kissenger, county surveyor, noted those in the flood zone area of the creek would definitely be affected. Turkey Creek, according to Kissinger and Dr. Nate Bosch, director of Lilly Lakes & Streams at Grace College, could not handle that amount of water. The creek would overflow its banks, taking down trees and causing log jams. Kissenger verified there is close to a 7- to 8-foot difference from the top of the control device to the bottom of Turkey Creek just below. He also noted there is a 31-foot drop in elevation from the control device to the bridge on SR 15 in Milford. Garceau believes there would be failure along the wing walls first with water channeling around those walls, but no catastrophic failure. Should failure occur along the wing walls, emergency construction steps would be needed as what happened in 1990 at the Lake Tippecanoe structure. Should the control structure fail, catastrophically, Wawasee, Mudd Lake and Syracuse Lake water level would drop close to 7 feet. On Wawasee this would mean the current shoreline would be moved more than 200 feet further out. Bosch noted mapping of the lake was done several years ago using acoustical technology marking the current shoreline, levels at 5 feet and 10 feet. Should there be a failure at the structure, “a large portion (of Lake Wawasee) would not be a lake,” he stated, noting it would be a series of smaller lakes as it was historically. “It would shrink in size and piers would have to be installed beyond the current allowed lengths.” Additionally he noted the lake would be a lot shallower, channels would be gone. Rock stated the structure is on the list of projects in the county’s multi hazard mitigation plan submitted and approved by FEMA in late 2018. 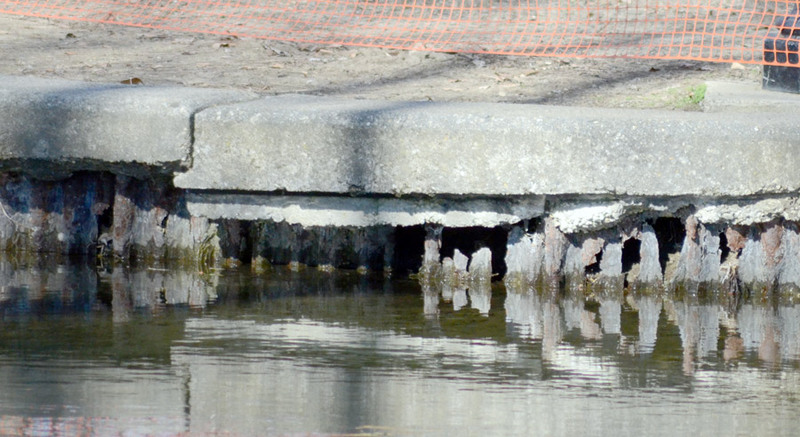 This means a mitigation grant could be submitted to help make repairs. 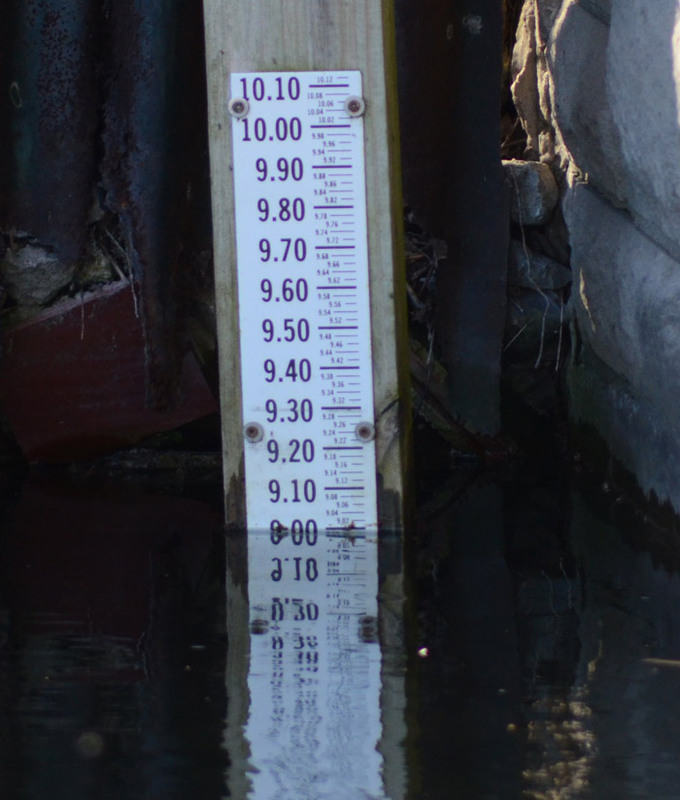 Currently one gate is opened on the structure and the water gage shows the level at 9 feet. The Syracuse Lake Level Control Device has kept the lake levels at Syracuse and Wawasee lakes at a height that benefit recreational activities and provided a positive economic impact to the area. The steel sheeting along the channel approach to the lake level control device is deteriorating with several very large holes causing bank fill material to washout. A safety fence was erected along the channel to the lake control structure Monday, but not because of deterioration of the metal sheeting in that area according to Syracuse Town Manager Mike Noe. “I don’t like the fact it’s open to water at a public park,” he said.